The temperature is dropping, the jumpers are coming out of the wardrobe, which can only mean one thing... Christmas is coming! But that's not all! Our 23rd Annual Christmas Open Day is also just around the corner! 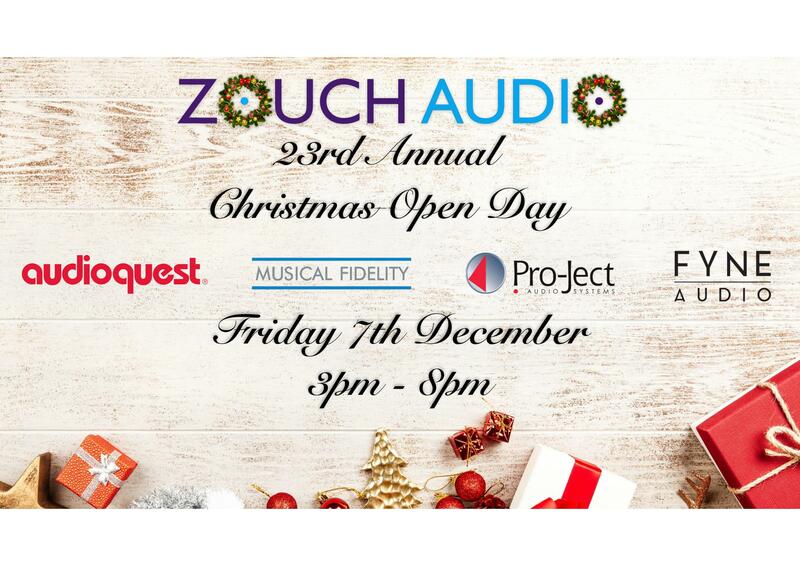 This year, our annual event will take place on Friday 7th December. The day will commence at 3pm and will run until 8pm. As usual we will be hosting a day of fantastic music, wine, and nibbles. We are delighted to have Dave Waters joining us from the all new exciting loudspeaker manufacturer, Fyne Audio. Dave is delighted to be presenting his unique range of speakers here at Zouch Audio. Cables are just as important as electronics. That is why Nick Allen from Audioquest will be coming along to show you just how cables can improve your system. Power management is vital, Nick will be on hand to demonstrate and show you how! Also in presence we will have Kieran Pickaver from Henley audio. Kieran will be on hand to answer any questions you may have regarding Pro-ject and Musical Fidelity. Be sure not to miss what is guaranteed to be a great day. There will also be unmissable deals throughout the day, so make sure to come along!